The new Lava Centre sits between five of Iceland’s greatest volcanoes. The exhibition reveals the epic forces of nature that shape our planet and created Iceland. Visitors get a crash-course in Volcanology while experiencing the extreme forces associated with volcanic eruptions and earthquakes. How was Iceland created? What causes the earth to shake? Which types of volcanoes are there and how can I “read the landscape”? These are just few of the questions people get answers to, and all through immersive experiences and tangible interaction. In the design we instantly decided to make it a fully immersive exhibition. How else could we communicate the extreme natural forces? We played a lot with sizes/scales because after all we humans are tiny in comparison to nature. Every installation was built on the best scientific knowledge available where we equally worked with both recorded data and live data from leading geological institutions and Universities in Iceland. As a result visitors experience earthquakes created by real seismic data and even hear the movement of magma within Eyjafjallajökull Central Volcano. The exhibition is fully interactive so every exhibit is either triggered or shaped by visitors’ motion or behaviour. 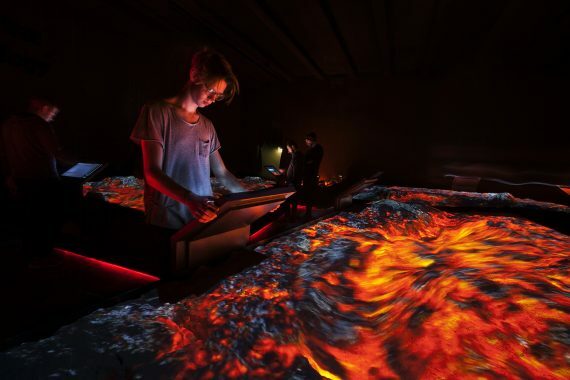 Visitors get to create Iceland, shape the crust with magma intrusions and eruptions that then result in mountains, rift valleys, islands, floods, craters and more. We knew that Nature has its own platform one can’t compete with, but we still wanted to deliver the right feeling so we also recreated elements with a certain abstraction in mind allowing the essence of the phenomenon too shine through. Monitoring of Iceland is an installation displaying real-time data to show the seismic activity in seven different Volcanic systems. The Interviews reveal how it is to live next to a Volcano which may seem weird to most of us. Here guests meet the people who have done so their whole life and experienced many eruption where they even had to flee their homes. The Volcano Corridor allow guests to walk from the present into the past and learn about every eruption in Iceland for the last 100 years while triggering explosive light and soundscape of lava flow. The Geology Globe is a large wheel that visitors can turn and learn that Iceland was created when the tectonic-plate margins drifted over a stationary Mantle plume that lies underneath the island today. In the Earthquake Corridor visitors can experience known earthquakes that shook Iceland in the last 20 years. The earthquake simulator uses the actual seismic data that was recorded when the quakes occured. An exhibit called The Fiery Heart of Iceland shows the size of the Mantle plume relative to Iceland. The reconstruction is in accordance with measurements done by scientists who measured the phenoma. In the Volcanology room visitors can learn about all the different types of volcanoes and volcanic systems found in Iceland. Finally there is a room called Mountain View where visitors can through full body interaction learn about the different volcanoes and take in the landscape around.